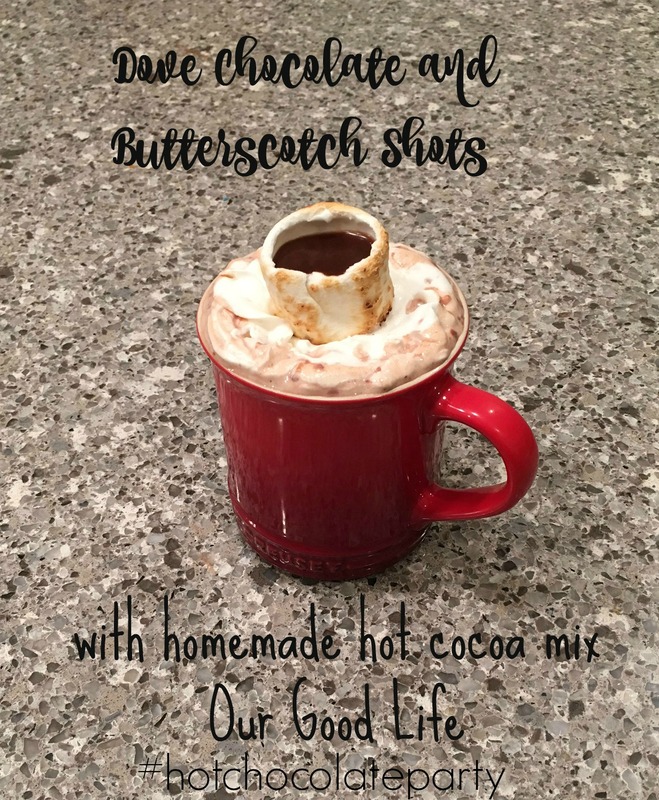 With the weather turning cold and blustery, I decided to invite a few ladies over for a #hotchocolateparty to enjoy each other's company and create a few new recipes for hot chocolate! We had a blast trying new concoctions. Before my guests arrived, I made a crockpot full of hot chocolate using a recipe I make for gifts for Christmas. The recipe can be found here. The only difference is that I made the recipe using whole milk, instead of water, for richness. I also made toasted marshmallow shot glasses, too. First you spear a marshmallow (the medium size, not the campfire size or minis) and toast it over a fire. Toast until golden brown. Be sure to toast the part of the marshmallow not speared by the fork! Next, slip the marshmallow off the fork onto a plate, with the untouched side as the bottom of the cup. The marshmallow will sink into itself, creating a cup, albeit a small cup. Then I set up all the fixings I was providing. I asked my friends to bring their favorite hot chocolate add ins. Look at the goodies! Biscotti, donut holes, cinnamon stick, regular marshmallows, Cinnabon vodka, and Dove Chocolate Martini mix and a special dipped marshmallow from Shari's Berries. Those are handmade, hand-dipped marshmallows and they are so good! When everyone arrived, all were eager to try the toasted marshmallow shot cups. One of my friends brought butterscotch schnapps, Rum Chata, and other goodies. We played with different shot combos and the winner was this Dove Chocolate Martini mix with a bit of butterscotch schnapps. So good! Hot chocolate with a Dove's Chocolate shot! Toasted marshmallow shot with Dove's Chocolate and butterscotch schnapps. Hot chocolate with a Shari's Berries dipped marshmallow. We laughed and giggled, chatted and caught up. New friendships were formed and old ones strengthened. We all decided we needed to get together again and have a Color and Whine party. Coloring books, colored pencils and wine and great company! I've seen tutorials about making the little cups out of marshmallows, but I haven't tried it yet. Such a fun thing to do for a get-together.